In accordance with only official statements, as a result of infighting, indiscipline, violation of weapon handling rules and suicide in March, 5 soldiers of Armenian army died, nearly 10 military servants wounded. Armenian authorities are using all methods to hide the facts of military incidents and death. Even achieve its legalization and adoption of court decisions forcibly in their favor. Despite all these prohibitions, analysis of the information spread on social networks and open sources show that Armenian army is in a bad condition. Mass brawl occurred as a platoon commander Levon, an officer who has been called to military service from Armenia, in the fuddle insulted local Armenians and Kurdish origin serviceman during argument regarding intolerance of service in Karabakh. As a result, several people were injured and taken to a medical station. Levon's nose was broken and he was hospitalized in Khankendi military hospital. The fact is investigated by the investigation team from Yerevan. Arman Rambelyan, who was mercilessly beaten by the serviceman with the surname Marelyan, was taken to hospital in a serious condition. Serious problems revealed in the health of the serviceman, named Yerem, who called to military service from Armenia and beaten before staff by Armenian commander Khron Gulyan, from occupied Nagorno Karabakh. Soldier named Albert Saakyan attempted to commit suicide by cutting his veins in six places as insulted by Karabakh Armenians. 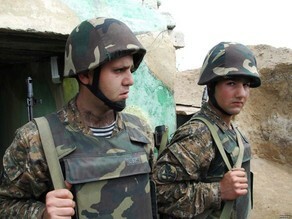 The other two persons - reconnaissance Arkadi Matevosyan and soldier Levon Akopjanyan willfully left service area not being able to bear severity of the service and insults. Another fact is death of Armenian soldier in one of the positions in Noyemberyan region on March 14. In accordance with Aravot.am website, the soldier has died as a result of suicide. But the death occurred for a very simple reason - the soldier fired himself feeding up by insults regarding not being able to divide a jar of packaged meat among soldiers and commanders. Condition in the Armenian army reached such a level that Armenian servicemen, being afraid, often fire their positions on right and left flanks of the frontline. Death and injury facts as a result of such incidents are concealed.